The flight service depends on contracts between the air carriers and the airports. Currently there are no flights on the route Medan - Kutacane - Banda Aceh. The last contract ended in December 2018. Negociations for a 2019 are still ongoing and a new contract is expected to enter into force for April 2019. The airfield name in Kutacane is ALAS LEUSER AIRPORT. SusiAir is a reliable and safe airline. They use small aircrafts. Pilots are from western countries. On the route between Medan - Kutacane - Banda Aceh usually a Cessna C208b is used. It can carry a maximum of 12 passengers only. They always fly with one pilot and one co-pilot. Ticket booking in advance is difficult, try phone or email: Hotline: +62811211-3080 or 3090; Email: info@susiair.com; Website: www.susiair.com ;There is a small office at Medan Kuala Namu Airport. Ahmad (the owner of Friendship Guesthouse) has a friend, who works at the airport Kutacane and gives him always the latest information about the timetable and prices. He can help making bookings for flights departing from Kutacane only. Check the flight schedule here. To go from Medan to Ketambe by public transport you have to go in sections. It is possible to reach Ketambe within 8 to 10 hours, depending on connections and waiting time. 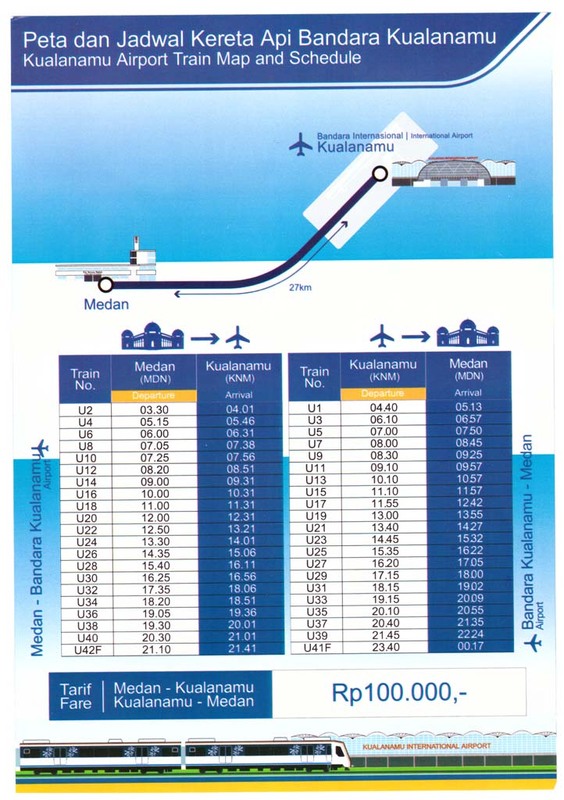 There are different transport options from/to Medan KNO Airport. The most convenient and fastest way is to use the train called Raillink which connects the Airport with the Medan Main Train Station besides the Merdeka Square. The ride takes 40 minutes and costs 100,000 IDR. There are 20 trains each direction every day. Please check the schedule here: Airport Train Schedule. The most common and busiest transport is by DAMRI bus. DAMRI has two bus shelters in Medan City, one at Jalan Gatot Subroto next to Carrefour and the other at Amplas bus terminal. Buses go when full. The fare is 15,000 IDR to/from Amplas and 20,000 IDR to/from Jalan Gatot Subroto. And of course there are taxis. The 35 km ride to Medan city takes 60 to 120 minutes, depending on traffic. The fare should be negociated and agreed before. Expect anything between 120,000 and 200,000 IDR depends on destination/start in Medan City and on your bargaining skill. Padang Bulan is the name of the area where transport to the west of Medan starts. From here buses go to Berastagi. Minibuses and shared taxis go to Kutacane. Along the road Jalan Jamin Ginting there are many different transport hubs from different companies. To reach Padang Bulan from the area of Grand Mosque (Masjid Raya) walk to a main road (Jln. Sisingamagaraja or Jln. IR Juanda) and take the local city minibus No. 41. It costs about 8,000 IDR. Ask the driver to drop you off at the minibus-stand at the companies BTN or Karsima, or at the taxi company Adi Guna Travel or CK Travel Wisata (the ride takes about 30 minuntes). If you arrive from the airport by train or DAMRI bus its the best way to go by moto-rikshaw (becak) to Padang Bulan. Even if you stay in a hotel, taking a becak is a nice experience to travel in the busy traffic of Medan. Don't forget to negociate and agree about the price before start. A ride to Padang Bulan area should cost between 20,000 and 40,000 IDR, depending from the distance. The most comfortable but most expensive option is to take a taxi, which will cost from 50,000 IDR. Please ask the price before you enter, because usually there is no any taxi meter available. From Medan Padang Bulan you can go by minibus to Kutacane. If you arrive at Padang Bulan from Medan city you will first pass the minibus station of BTN on the left side, about 500 m further is the station of Karsima. Both have a small ticket counter and a waiting area. The service and the ticket price is equal at both companies. Its 70,000 IDR. In a minibus (see 2 pictures beside/below) there are 2 seats beside the driver and behind there are 3 rows with 3 seats each (together space for 11 passengers). Try to get a seat behind the driver for more leg space. Women should ask for a front seat. Avoid the last row where you actually sit on the axis. Minibusses leave when full or about every hour until late afternoon. In the morning they go more frequent. There are few night busses which start about 9 PM. The ride to Kutacane takes about 7 hours. You can catch this minibus in Berastagi, if not full. From here it takes 5 hours to Kutacane. For this you have to wait at the main road in Berastagi near the busstation/ market to flag down the minibus. If you ask the staff in your guesthouse usually they can help. The companies Adi Guna and CK Travel Wisata offer a more comfortable, aircon public shared taxi service with modern cars (Toyota Kijang, see picture beside/below) between Medan and Kutacane for 130,000 IDR. The car has leather seats, one beside the driver and 2 rows with 3 seats each behind. A maximum of 7 passengers can go, but sometimes they start even with less. This service is not as frequent as the minibus. It starts when full or usually about every 2 hours. Each company has one night taxi at least. They have limited space for luggage. The stations are also at Padang Bulan. CK Travel is on the left side, opposite the "Citra Garden" (picture see beside/below). Adi Guna Travel is on the right side about 250 meters after "Citra Garden", just 50 m behind the Carrefour supermarket. The public shared taxis will stop for a meal near Berastagi. Normaly the final station is in Kutacane city. If you ask the driver, he can bring you all the way to Ketambe for an extra total of about 100,000 IDR for all passengers in the car. For the way back we can arrange a shared taxi to pick you up in Ketambe. The driver will drop you off in Medan city at the place you wish or continue to the airport for a negotiatable extra charge.